I love finding new trails to run. One of the ways to keep running fresh, exciting and NOT let it feel like a job is to frequently change things up. Running a new trail is an adventure. When I take the kids, they think we are exploring and they are right! We are exploring! So if your run routine has become stagnant, go somewhere new to run this weekend. Yes, you may need to step out of your comfort zone get into your car and drive there but it will be worth it! Go, explore! 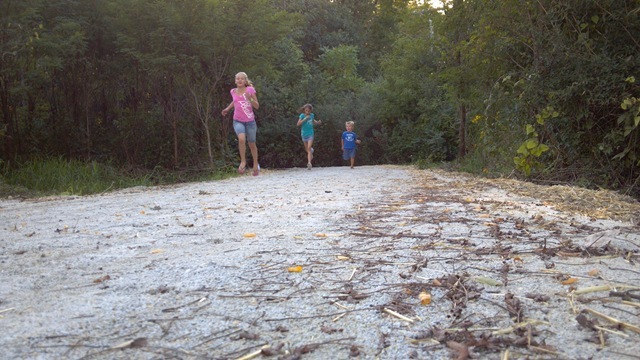 This last weekend, the kids and I went exploring at Goodenow Grove in Crete, IL. This Will County Forest Preserve has been closed for an entire year as they revamped the nature center and cut new trails. 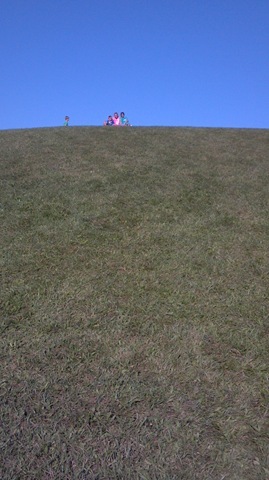 The main attraction for the kids is always the massive hill that they can run and/or roll up and down. 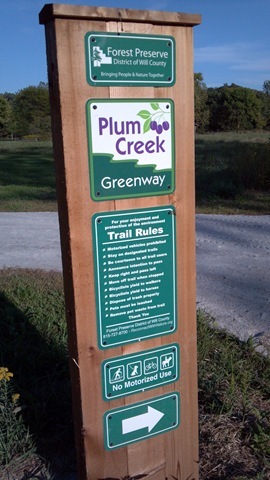 The main attraction for the runner in me was the new Plum Creek Greenway Trail. 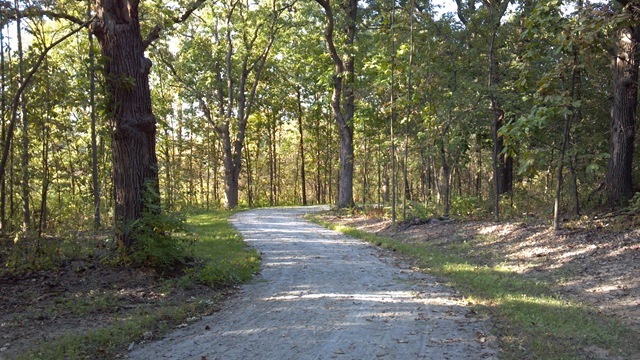 This new trail begins on Goodenow Road, just west of the Dutton Road access and is 3.06 miles in length (one way) as it weaves thru the Grove and ends just north of Bemes Road. The new trail is crushed limestone and very soft at this point since it hasn’t yet had the weather and traffic to pack it down. The kids and I absolutely LOVED this trail. I couldn’t even keep up with the kids as they excitedly raced ahead to see what was beyond the “next” curve. I was constantly calling them back and stressing, particularly to Aby and her friend Sara, that they had already ran hard that day at a local Cross Country Invite and they needed to walk. They didn’t care or listen, just kept running. Begging me to go further. Aby, Sara & Michael at one point running back to me. Yes, Aby even runs in flip flops. And Michael runs everywhere particularly when he has the opportunity to chase pretty girls. I think its a sign of a good trail when you can’t get the kids to go back to the car. The terrain was soft, had lots of open area with wild grasses and flowers, shaded wooded areas, lots of curves and a few hills to give it variety. There were also spots not too far off trail in the main section, near the Nature Center where water and bathrooms were available. I think I’ll be heading back this weekend to run the entire length of the trail with the girls. I’m anxious to cover the entirety of the trail and the girls begged me to take them back. I’ll have a more in depth post with a map since I lost mine soon but I just wanted to put this new trail on your radar because who doesn’t want to try a cool new trail that is close to home? This entry was posted in Running and tagged Goodenow Grove, Plum Creek Greenway Trail, Running, running on the southside of Chicago, Trail Running by tootallfritz. Bookmark the permalink. Ooooh nice!! This is only 20 minutes from my house. Thanks for the heads up. I am always on the lookout for new trails. Funny it is hard to hold back the kids. Sooo pretty. Jealous of trails, we really don’t have anything like that here. Concrete jungle and all. Wrote out my ragnar running prep plan and ohhh, its going to be a challenge to not get bored. Going to have to change up the scenery somehow! I used to run on the roads exclusively so I totally understand where you are coming from. You’ll make it thru but I wish you had somewhere pretty to run. Illinois has some of the best trails and alot of them.. I missed that, but we are getting more. It is always nice to run outside my neighborhood/town. I would love to find some place different this weekend. Love our trails. I’m from Indiana originally and we didn’t have these type of trails in my area. 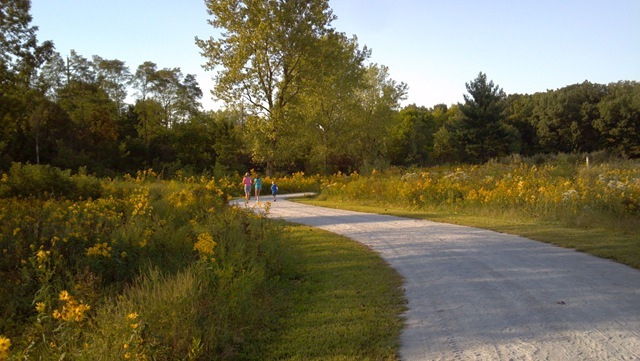 Indiana is getting better but IL has trails everywhere. I love the lakefront path but the weather has to be just right, or maybe cold, for me to really enjoy it. Shade is limited and the pedestrian, tourist and bike traffic takes a lot of patience. I love finding new trails. My only rule of thumb is that I have to run at least as long as I drive to make it worth the effort. It definitely does wonders for the soul when exploring new terrain. Great rule! That absolutely makes it worth it. Great to here the new trail and preserve improvements are completed. GGFP is one of my former work haunts and I did a lot of bio-survey work out there and a lot of time on the natural areas management of portions of the Nature Preserve. Wow…if the trail is 3.06-miles 1-way out, seems like they might be able to offer a 10k to their future fall fests! They normally do a race there during the fall fest but it just reopened. They will have races there in the future!